- Black with a round 5 dioptre lens. (#CAPG008B). Features: Uses a 5 dioptre Glass Lens which has a diameter of 12.5 cm. Is black in colour and has a power switch near the lens. Uses a Fluorescent round bulb (22 watt) and spares are always in stock. Comes with a table bracket to mount the unit and a wall bracket can also be purchased. Mostly bought by Beauty technicians. Power specification:- 22 Watt, Volts and 50 Hz. A manufacturers warranty of 12 months applies. 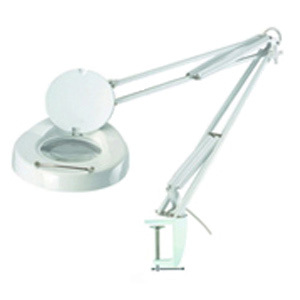 CAPG009W White Magnifying Lamp on Stand for Beauty salons. CAPG002B Black Beauty Magnifying Lamp on Stand. CAPG004W Mag Lamp on Stand with large lens. CAPG005 Desk Top Lamps . CAPG005LED 3 dioptre Mag Lamp with LED Light composed of 60 diodes. CAPG006B Black Mag Lamp with bendable arm and bench bracket for mounting unit. CAPG008W Magnifying Lamp for Beauty Salons. 5 dioptre lens and comes with mounting bracket. CAPG010 Mag Lamps with extra Magnifier lens. CAPG012W Mag Lamps with large lens and two 9 watt bulbs. Glass Lens size is 17.75 x 15.5 cm. CAPG040 This LED Magnifying Lamp is fitted with 108 diodes. CAPG041 LED Magnifying Lamp comes with a pedestal and is fitted with 108 diodes positioned around the 5 dioptre Glass Lens. CAPG070 Mag Lamp. Sits on a bench with adjustable head position and height. CAPG090 Magnifier used for Beauty treatments in Salons, this LED Magnifying Lamp has 90 diodes. CAPG091 LED Magnifying Lamp for Beauty. Fitted with 90 diodes and sits on 4 legged pedestal. CAPG001WL Round Glass replacement Lens with a diameter of 12.5 cm. CAPG003WL Rectangle Glass replacement Lens. Dimensions are 17.75 x 15.5 cm. CAPG005L Replacement bulb - 12 watt. CAPG031W Floor Stand - White. CAPG050B Black Wall Bracket for Magnifiers. CAPG053 Spare bulb - 9 watt, 2 pin. CAPG053A Spare bulb - 9 watt, 4 pin. CAPG054 22 watt replacement bulb for Beauty Lamp CAPG008W. CAPG056 Spare bulb - 28 watt. CAPG057B Desk mount - Black. CAPG057W Desk mount - white. Payments accepted online with MasterCard, Visa, Amex or PayPal. * Desk top, Light with Clamp and Floor Stand models available. * Full Magnifier Lamp range is available for inspection at our Canberra store.